The difference between a good project and a great one is having the right partners on your team. NEXPO is the one-day industry supplier and maker exhibition at the 2016 SEGD Conference Experience Seattle June 10. The difference between a good project and a great one is having the right partners on your team. 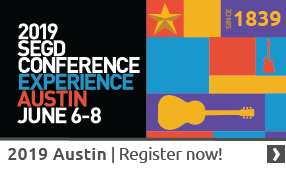 NEXPO is the day-long industry supplier and maker exhibition during the 2015 SEGD Conference: Experience Chicago June 4-6. Looking for new fabricators to help bring your ideas into reality? Need to research ADA signage or sustainable processes for your next project? Whether you’re looking for collaboration, information, or inspiration, NEXPO is the right place for you! There’s still time to register for the full conferenceJune 4-6 in Chicago! Or you can also get a one-day NEXPO pass!